Bran Hambric was found locked in a bank vault at six years old, with no memory of his past. For years, he has lived with one of the bankers, wondering why he was left behind — until one night, when he is fourteen, he is suddenly confronted by a maddened creature, speaking of Bran’s true past and trying to kidnap him. Bran finds that he is at the center of a plot which started years before he was even born: the plot of a deadly curse his mother created…and one that her former masters are hunting for him to complete. Haunted by the spirit of his mother’s master and living in a city where magic is illegal, Bran must undo the crimes of his past… before it is too late. Kaleb Nation’s first story – penned at age 9 – featured the heroic and egotistical King Kaleb on a submarine journey under the North Pole. At 12, Kaleb phoned the editor of a major publisher to pitch a book idea but was sent to talk to security instead. Unhindered, he continued to write as a teenager and completed his first novel in 2003 when he was 14. 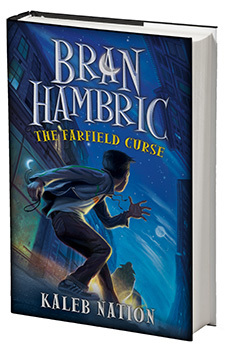 Six years and many edits later, his book was published in multiple languages as his 2009 debut novel The Farfield Curse. Its sequel, The Specter Key, was published on 10/10/10. One of his publishers is the same company that rejected his call years before, but everyone is friends now. © 2018 Kaleb Media - All Rights Reserved.